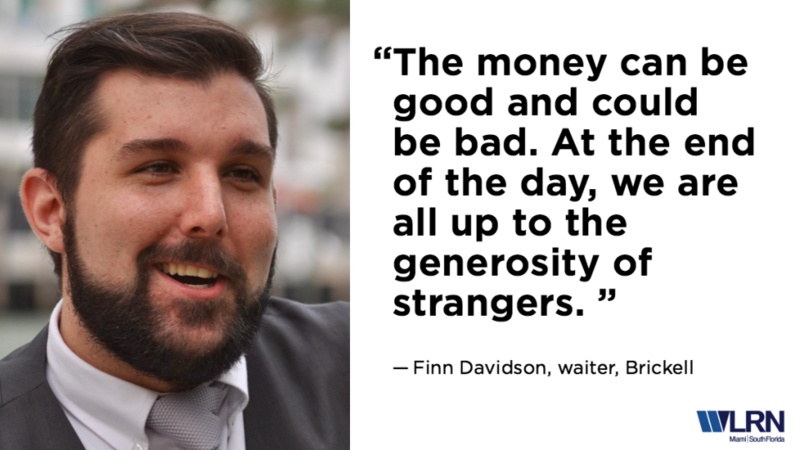 There are 60,000 people working as waiters and waitresses in South Florida. Many of them work for tips, plus a small minimum wage. 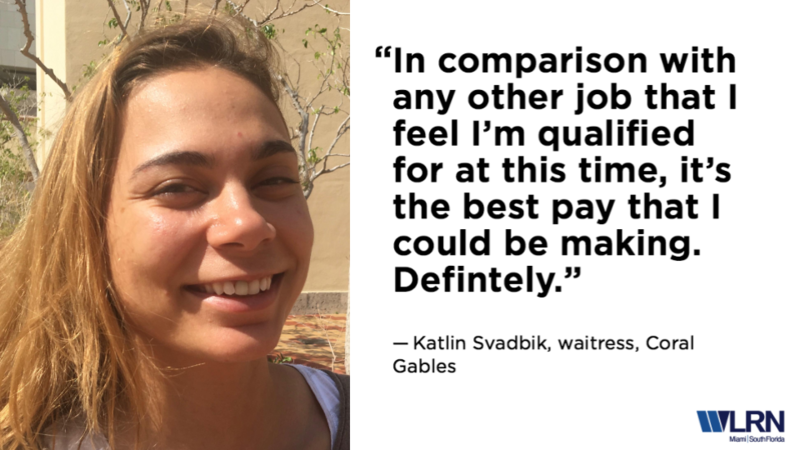 They are among the almost 60,000 people in South Florida working as waiters and waitresses. Both are servers at a restaurant just off Miracle Mile in Coral Gables. While they make a small hourly minimum wage, like a lot of servers they work for tips. And they share those tips with other workers at their restaurant. 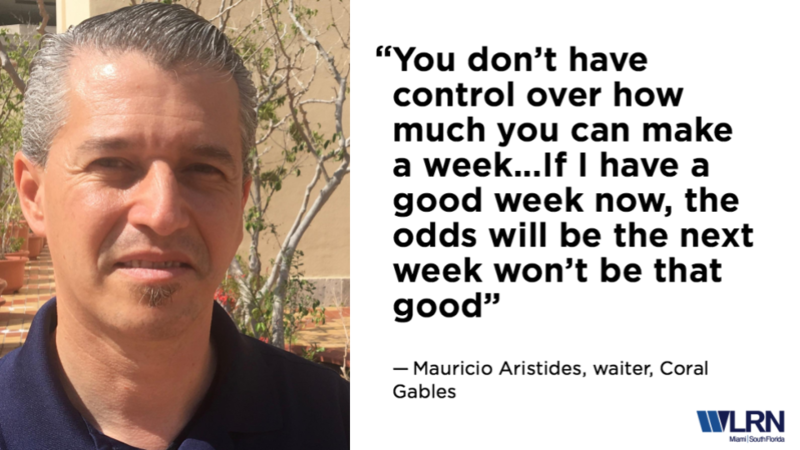 "When I have an average of $22 per hour, that is a really good week," says Aristides. "When you do $25 an hour, that is an amazing week. Some weeks you will do $18 an hour. That is still good when compared to other jobs." Aristides and Svadbik say they share 30 percent of their tips with others at the restaurant, such as bartenders and busers. "It's going to a team of maybe eight people on my shift," Svadbik says. According to the Bureau of Labor Statistics, half of the waiters and waitresses working in South Florida made more than $10.14 per hour, half made less in 2016, the last time the government reported such wage data. According to state data, the median wage for restaurant servers is far below the median wage for all jobs. Finn Davidson also makes a living on tips. He is a waiter at a steakhouse in Brickell. He says the restaurant where he works pays out tips after each shift with a regular paycheck based upon the tipped minimum wage. "The money can be good and could be bad. At the end of the day we are all up to the generosity of strangers," he says. In Florida, there are two minimum wages; one for workers who don't normally get tips and one for workers who do. In March, when Congress passed and President Trump signed into law a budget for the federal government, included on page 801 of the legislation is a compromise over tipped employees. In 2011, the Obama administration changed the rules and banned restaurants from pooling tips and allowing employees who normally wouldn’t get tips a share of the money if they were paid at least the regular minimum wage. Several courts ruled this invalid. In 2017, the Trump administration began work on changes that would have allowed restaurant owners more discretion over paying out tips. The idea attracted tens of thousands of public comments to the Department of Labor. The department’s own economic analysis showed employees could lose billions of dollars in tips. Critics complained that the rule would have allowed restaurants to pay a full minimum wage, collect tips and not share them. Instead, a compromise was struck allowing tips to be shared, but not with managers and supervisors -- and only if all employees get paid at least the regular minimum wage. 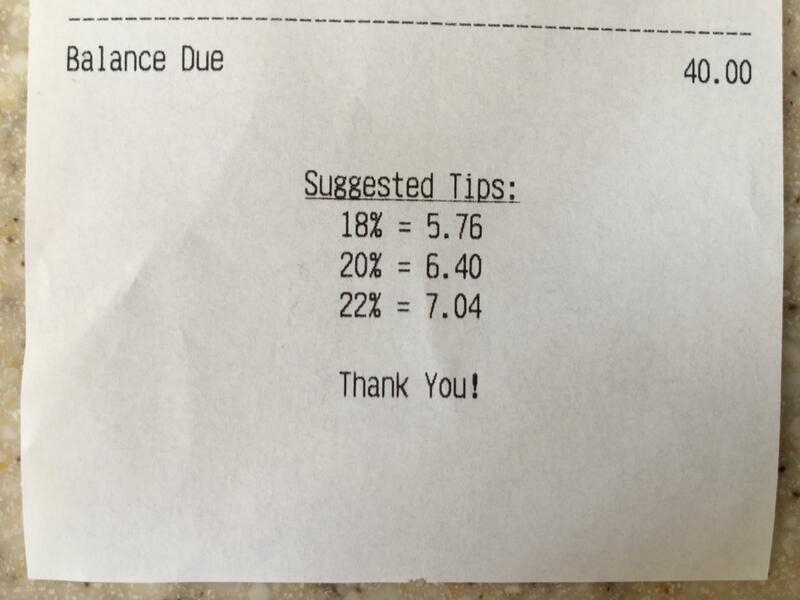 In Florida, for servers who already get paid the lower minimum wage because they get tips, the rule doesn’t apply. "There is probably not a waiter in Florida who doesn't make the difference up in tips," says Richard Turner, senior vice Ppesident of government relations for the Florida Restaurant and Lodging Association. "Most tipped employees exceed minimum wage by a considerable amount." Wage data from the Bureau of Labor Statistics shows the lowest hourly median pay in the food service industry is for fast food workers, counter attendants and bartenders. Half of those workers in those jobs are making more than about $9.30 an hour -- over the state minimum wage -- and half are making less. Jason Emmett says he pays all of his wait staff the state minimum wage and they contribute to a tip pool to share with other front-of-the-house employees who aren't waiters and waitresses. Emmett is president of Duffy's Sports Grill. It has 34 restaurants in Florida with more than 3,200 full- and part-time employees. "There is no wage press in the front-of-the-house. It forces us to be competitive in every other way, such as a good work environment." he says. As for those non-tipped jobs? "We don't have anyone even close to minimum wage in the back of the house." Danny Meyer would like to do away with tips altogether. He isn’t a celebrity chef or a CEO of a multi-national restaurant chain. His company runs 16 cafes and restaurants -- all of them in New York City. And in 2015 he announced his plan to eliminate tipping. "Tipping is on it's last legs," he tells WLRN. "It may take another five or 10 or 15 years, but as a practice it does not help people to feel like real hospitality professionals." 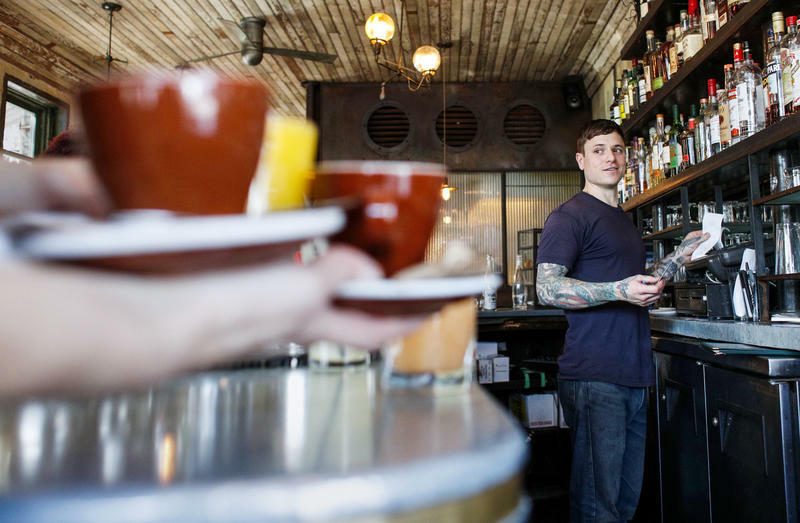 Various restaurants across the country are experimenting with the hospitality included model. Some have tried it and returned to the usual tip not included. Meyer acknowledges he lost staff when he first embedded a 20 percent gratuity in his menu prices. He estimates about a quarter of his staff quit. But that has reversed, he says. "Since 2015, our turnover rate has gone down quite dramatically. It's now below the industry and below where it was in 2014."